I like your card a lot. Pretty ornaments and they don't look wonky to me! Sylvie this is a super Christmas card. Someone's going to be very organised for Christmas...fab card Sylvie. Wahey - I pressed the button and found you yay!!! This is great Sylvie, I love the colours and the bling!!! So beautiful. 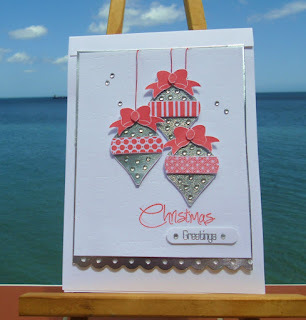 Love this card, so pretty ornaments!!! Fab Xmas card Sylvie, I'm just waiting for some CB stamps to arrive:) will you be on the prog tonight? Fabulous Christmas card. I love the design, very elegant. This is really elegant Sylvie! Love all the bling! So festive!! I love all the sparkle! Stunning card! I love those baubles...although they look a bit strange with that gorgeous view!!! It was arm here today too. got a little gardening in and then we put up our feet and relaxed for the rest of the afternoon! You did it right, Sylvie! This is fab. Love the Baubles. Sunshine and Christmas? Now there's an unusual combo! Have a fun day. A fabulous crimbo card, love the design! Gorgeous fresh Xmas card, Sylvie! Love the pop of red! The weather in the UK is just awful still! We've had a few days of sun but it's still cold and it's now cloudy and wet for the next few days. Can you get me a job in Gibralter please?!! Gorgeous card Sylvie, love the pretty baubles. Great Christmas card, love the bling!